The Excel to Outlook Converter can export contacts from Excel to Outlook Address Book with user’s convenience. It has the ability to transfer contacts from spreadsheet to Outlook in batch. 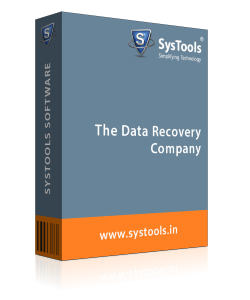 It comes with an advanced feature to remove duplicated contacts during XLS to PST migration. 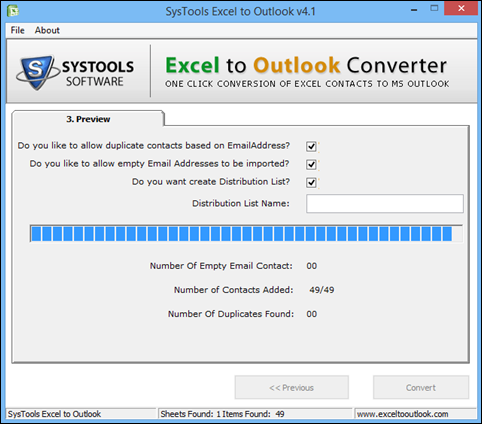 The Excel to Outlook contacts converter tool supports Microsoft Outlook 2016, 2013, 2010, 2007, 2003 and lower versions on Windows 10, Windows 8, Windows 7, Windows XP and all lower editions. 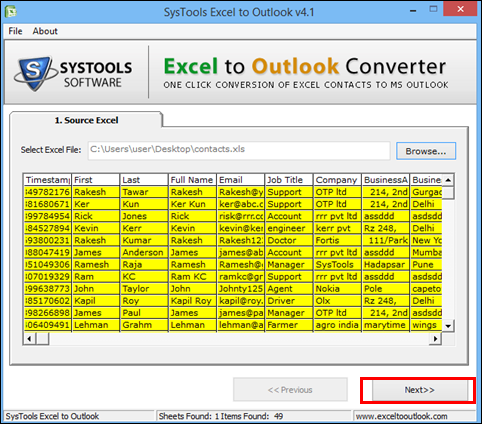 This Excel contacts to Outlook Converter switches XLS contacts to Outlook address book. It converts all related details like first name, last name, address, number, email, etc. from Excel spreadsheet to Outlook contacts. 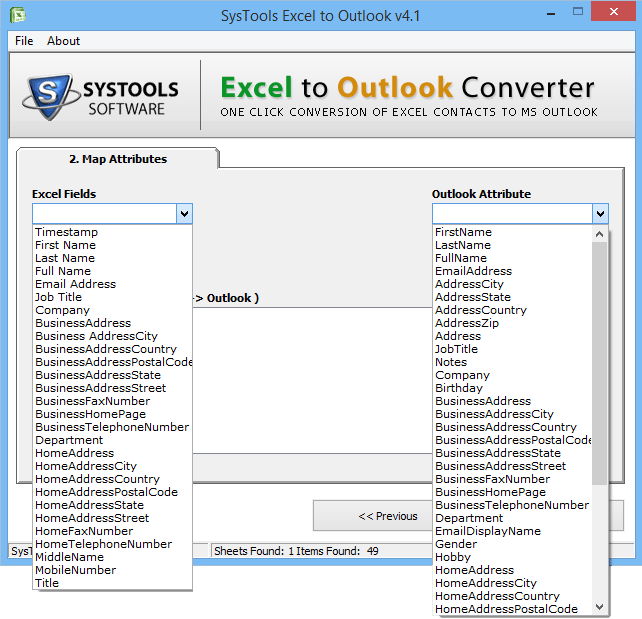 Using this Excel to Outlook contacts Converter, user can properly manage all details and fields are mapped properly. For example, first email address of Excel sheet is accurately mapped with first email address of Outlook. While conversion of XLS contacts to Outlook Address Book, there is a feature that eliminates the duplicated contacts from the list. The Excel to Outlook Converter also gives users option to include these contact as per the need. If user is exporting email addresses from XLS to Outlook and certain contacts have this field as blank then, there is an option to remove this contact completely from the list during the conversion. 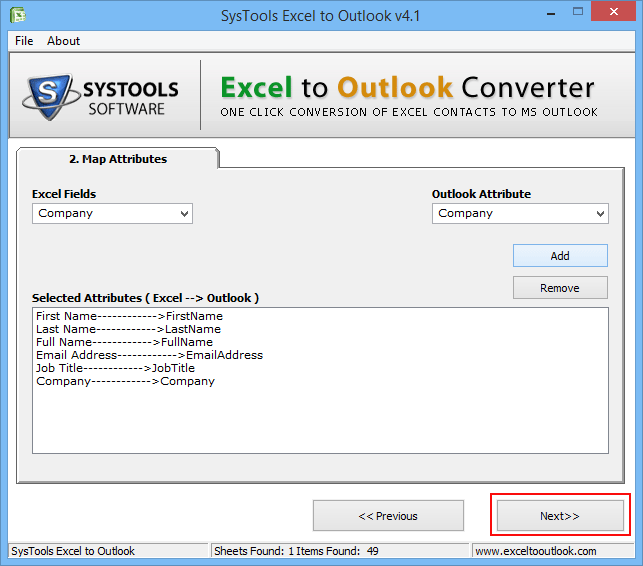 Convert Excel file to Outlook contacts using this tool allows users to create a distribution list instead of saving contacts in Outlook Address Book as a list. Also, users can name this list according to their own choice. 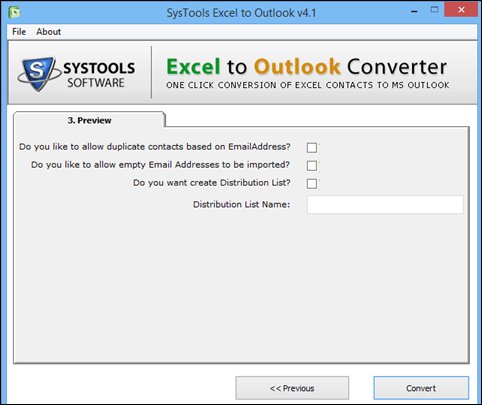 As users export Excel contacts in Outlook using Excel to Outlook Converter software, contacts are directly configured and saved in Outlook email. Once the migration is finished, user can open contacts folder in Outlook and access them. How to import Excel contacts to Outlook? 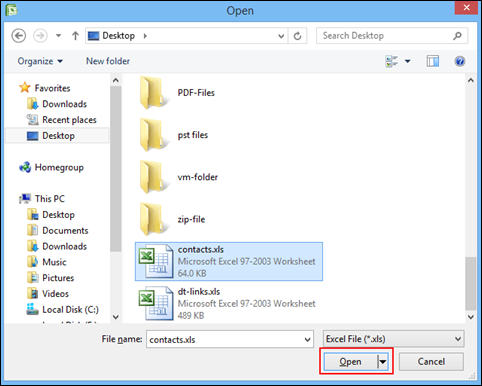 Step 1 : Download and launch Excel to Outlook Converter. A window will open on screen in which click on Browse. Step 2 : Select the desired Excel file which you want to export to Outlook address book and then click on Open option. Step 3 : Now, the tool will preview all the contents of the selected XLS file. Here click on Next. Step 4 : In the next window, choose Excel fields from the left side and match the same Outlook attributes from the right side. Step 5 : Click on Add then, Next button after matching the fields, a list of matched attributes will be shown after this. Step 6 : In the following window, check the options you want to handle during conversion and click on Convert. Step 7 : Then, conversion process will start showing the details of contacts getting converted, duplicated, etc. Step 8 : After conversion from xls to Outlook gets completed, a message will appear confirming the same. Q. 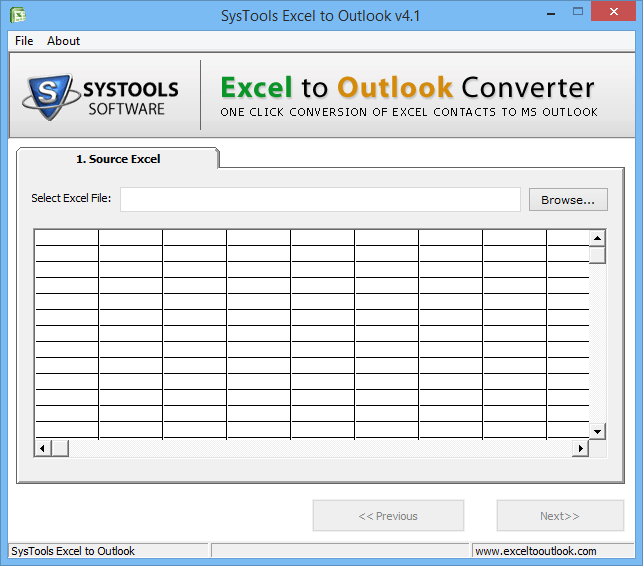 Will this XLS contacts into Outlook tool convert multiple Excel address book to Outlook? 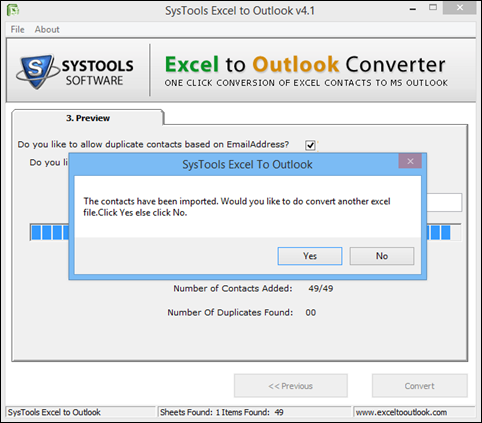 Ans: Yes, this tool can convert multiple files from XLS format to Outlook. Q. What number of files can this Excel to Outlook Converter support? Ans: Yes, using this excel spreadsheet to Outlook converter, you can convert any number of files. Q. Can I import contacts from excel file to Outlook email on my Windows 8 system? Ans: Yes, you can transfer all Excel contacts to Outlook on Windows 8 and on any other Windows OS. Q. Will the contacts of Excel be mapped with Outlook Address book? Ans: Yes, there is a feature that allows users to map each Excel field with Outlook during the migration of contacts from excel file to Outlook Address Book. Note: Excel to Outlook Software will get delivered on your registered email id, within few minutes after placing the order. This application to migrate Excel contacts to Outlook is not just affordable but also very reliable. After switching from one tool to another, finally my search has ended with this tool. Its absolutely easy to use and it took very less time to import contacts from xls to Outlook email. Its an all praise software from my side. I loved using it. A big Thanks to your team for designing such a proficient Excel to Outlook Converter tool for converting Excel files into Outlook. It has every feature one looks for in a conversion tool. I am more than happy after using this Excel XLS to Outlook Converter software.